From January to June and then from mid September to just before Christmas. To see if the dates your want are normal season, click on the dates you are interested in visiting the Village Hotel to the left and it will show you availability and the total cost. From June to mid September. To see if the dates your want are high season, click on the dates you are interested in visiting the Village Hotel to the left and it will show you availability and the total cost. Easter and Christmas. To see if the dates your want are peak season, click on the dates you are interested in visiting the Village Hotel to the left and it will show you availability and the total cost. If these times are difficult for you, please just let us know. Casa Veche sleeps seven adults at a squeeze. There is a large bedroom upstairs with two double beds, the bunk room and the sofa in the living room is also a bed. You have the whole house to yourself where you can cook dinner in the large kitchen/dining/living room that is great for a party, or to just relax in and use as your home from home. The house sits on a private plot along with Casa Mica in the middle of Breb in Maramures, backing on to the steam running through the property that is within a 5 minute walk of the church and the main bar/shops in the village. To see high quality pictures of Casa Veche and all the rooms inside – click on the arrow in the center of the picture below. Casa Veche is from Breb. The owner was going to knock it down and sell it for fire wood, or to a ‘stranger’ to take it to a museum abroad. He didn’t care where it was going, he just wanted it off his land so he could plant some more potatoes. We don’t like buying houses from the village, we rather get them from any where except Breb but we also think it’s best to help keep what is here, than to let it go. It was taken down and brought it our land in 2011 and completely restored using traditional building methods mixed in with a modern shower. The beds are new; hand made in the way they have been for years but to fit 5 star quality mattresses and not ones made of straw like the ones we found in Casa Mica when we first arrived in Breb. All labor used to restore the house were locals from Breb helping the local economy and keeping the village alive. A large part of the money you spend on staying in Casa Veche goes to the local community. Not because we are some nice NGO (ask me about NGO’s over a beer;) – we are a real business that employes locals like Maria who works for use full time and is from Breb. As we are still investing in Breb, most of the money goes into the local economy one way or another, what is left is spent on food, petrol etc, all spent locally so… you get the idea. The house was restored in 2011 and finished in the summer of 2012. We have great satisfaction seeing our guests enjoy the house and have been far buseir that we ever expected. Maria could never understand why someone would want to come to her village, but she too is discovering Breb in a way she never saw before. If you are thinking of coming to stay, I suggest you bok as far as you can inadvance as times like Christmas and Easter will be booked months ahead. To check the availability of Casa Veche go to the booking page. 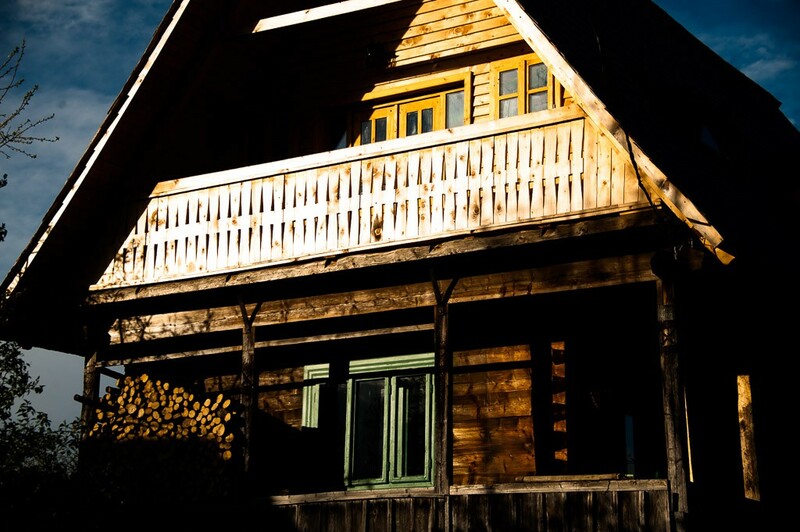 Casa Veche is made of pine ( Brab in Romaniain)and is around 90 years old. The walls inside are made of mud taken from local clay pits that provide the insulation in the cold winter whilst keeping the house cool in the summer. The house sits just in front of the stream and faces out into the courtyard area where there is a covered barn for lunch when sunny or to keep the snow off you when your having a Horinca around the open fire at Christmas. Casa Mica is next door so if you have rented both house you have the whole place to yourself. Perfect for 50th birthday parties, getting friends together or taking your kids and some of their friends on holiday. 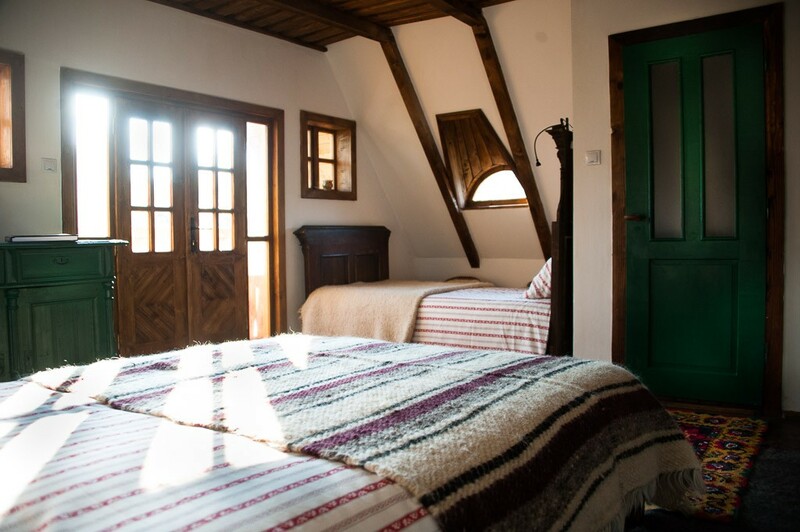 You have Casa Mica and let the kids loose in Casa Veche and get a good nights sleep. The house has a good karma and even though it’s second life has been a short one so far, there have been a good few parties and good times in it already. Who knows what will happen when you come and stay, what ever you do, you will feel the relaxing atmospher that has made the hardest of back packers stay a whole extra week and sleep half the day whilst reading William Blackers book called Along the Enchanted Way that he wrote whilst living in Breb in the ’90’s. The Kitchen is the heart of any Maramures home. It is where everything goes on, and in the winter, every one lives in this room as the stove is kept going none stop along with food for men returning from the fields and a bottle of Horinca for any one who may drop in. Well in Casa Veche we have kept to this tradition and made the room the focus point of the house. You can cook for up to 10 people I think we have had in here now and still space for a local or two who may come in to see what all the foreigners are up to. There is a brand new electric hob with four rings that heat instantly. The oven is also electric allowing you cook a Sunday roast… what ever you want. There are plates for six and if your group is staying in Casa Mica you have enough plates for ten, and chairs. Good company and good cooking – This bit is a bit up to you, if your fun and want to party, chances are so will we and if there are a few backpackers staying a quite little house can become the center of the universe and become the place to be as the dinner is cooked by every one. Some get the wood, some take over the oven and the smart ones talk about too many chefs over a glass of wine as they do as they are told and chop the onions. You can have dinner every night in one of the locals houses and have traditional Maramures food cooked for you. Or you can cook yourself and create your own dinner party in the way that you like it. Casual and every one mucking on or dress for dinner and have name tags… up to you, we’re here to facilitate what ever you want and will help you make a dinner to remember. The house is stocked with pasta, rice, cooking oils, spices etc, everything you need to make what ever meal your are craving if you have been on the road for someone time and getting bored of Mamaliga and Chorba. All you need to do is go t the local store and stock up on some meet and veg and off you go. The Snug – After dinner if there is a whole gang of you, you can all huddle around the open fire for tales of bears in the mountains from little red riding hood or some drinking games with you guessed it, a bottle of local Horinca. if you a couple I don’t need to tell you how an open fire can affect the old romantic in you. It makes the fire come alive in the winter, and in the summer you can have a fire outside in the fire pit between the two houses and look up at the milky way which very clear at night even in the village. The wood comes from the 25 hectares of land we have that we are slowly turning into a farm, so every log your burn is being regrown a mile or two up the mountain. There are board games and a growing collection of books on Maramures for you to read and help plan your day trips out of Breb in Maramures. Double Bedroom – The double bedroom is large and can sleep up to four people in the two double beds. There is a wardrobe and a dresser to put your clothes along with a few chairs and and old bench to rest your book on after turning the reading light out at night. The rugs and bed throws are all locally made and will keep you as warm as toast in the winter and the traditional window opens outwards letting the cool air and the sound of the stream in through the window in the summer. There is an oil heater for the middle of winter, but as long as the fire is made below in the main room of the house you should be warm and snug. The beds are locally made by our goddaughters father, Georgie and the mattresses are 5 star quality with fresh cotton sheets every few days if required. The Bunk Beds – Kids for sure will fight to the death for the top bunk. Adults pretend they are cool and happy to sleep on the bottom, but it’s like getting the back seat on the coach at school on in the boot in an estate car. if your a kid, it’s important, if your and adult… you will take you back to when it was important and will bring the kid in you out. The beds are hand made and 2m x 90cm, so full size by any ones standards. The bunk room is a good size and has a large arm chair for chilling and reading a book on or to throw your cloths over. There is a dresser to put clothes in and a table for laptops and ipads to be recharged on. Each bunk has it’s own reading light with it’s own light switch so you can turn the light off after reading without getting out of bed. The traditional half window was hand made locally and lets in the sun in the morning giving you a bright start to the day and a light breeze through the room on those hot summer nights. There is an oil heater in the room for the winter but the heat rises up the stairs keeping the room warm when there is a fire burning in the living room. The Couch – Some people who stay in Casa Veche on their own like to sleep in this bed as it is next to the fire, next to the toilet and next to the kettle in the morning for a cup of tea. 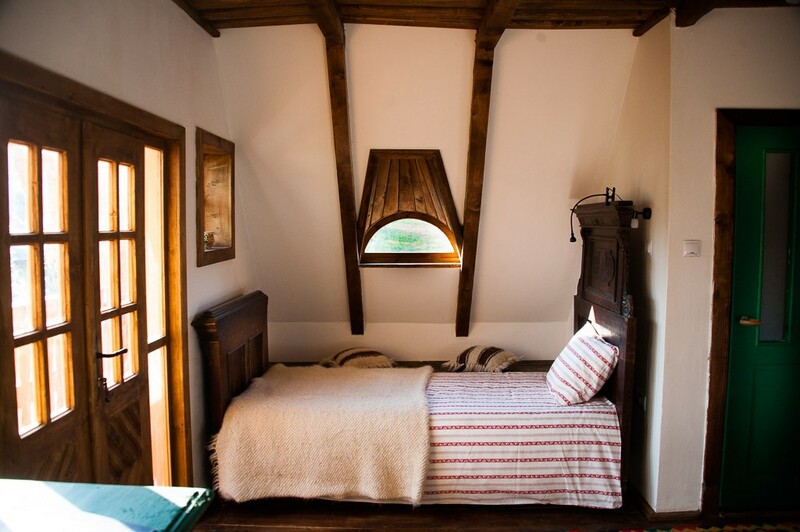 It is a traditional Maramures bed made to sleep on and sit on during the day. The mattress is 2m by 90cm, so full size and always made up for sleeping, as well as having cushion son during the day for those lazy afternoons in front of the fire. Want to see more pictures of the family room? Casa Mica booked for the dates you want?